Raju Chellam - Vice President of Fusionex, Lau Bik Soon - Group Chief Executive Officer of REDtone International Berhad, and George Pan – Chief Technology Officer of Huawei Malaysia at the MoU signing ceremony. 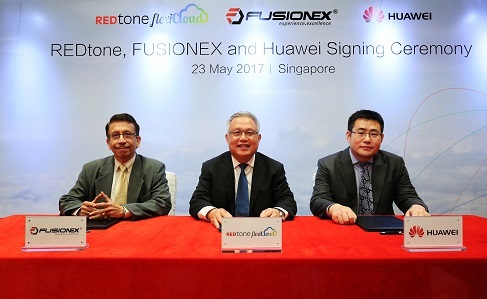 [Singapore, May 23, 2017] Huawei, REDtone and Fusionex announced the forming of a tripartite partnership to serve the rapid increase in demand for big data and analytics Cloud solutions in Asia Pacific. A Memorandum of Understanding (MoU) between the three parties was completed at the Huawei eco-Connect, Singapore, in conjunction with CommunicAsia 2017, the largest ICT trade event in the region. REDtone flexiCloud platform acts as a catalyst for innovation and digital transformation. The ability to quickly change internal processes to match dynamic environments can be a differentiator for businesses. While building new business models, enterprises need the agility, ability to scale up and down, efficiency, elasticity and cost optimization in order to triumph in the industry they operate in. For more information, please visit www.redtone.com. Fusionex is a multi-award winning international provider of software solutions, specializing in Analytics, Big Data, the Internet of Things (IoT), Artificial Intelligence and Deep Learning. Its offerings help organizations manage, understand and derive value, insights, and foresight from data.